Don't mess with the Jones Family! Interpretive artwork inspired by Indiana Jones and the Last Crusade. Artist-signed limited edition of just 95 pieces. Huge canvas print measures 30-inches wide x 20-inches tall! Who can forget the incredible adventures of Indiana Jones. 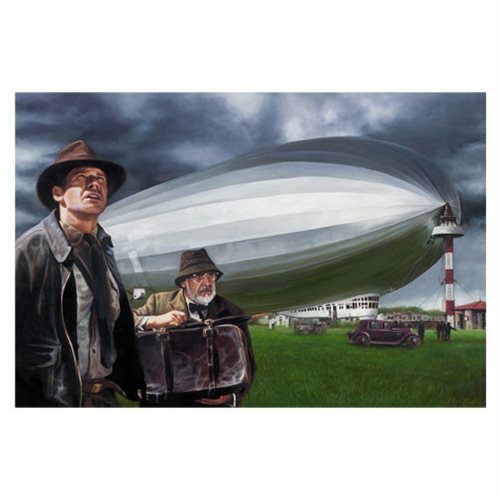 This Indiana Jones Crusade by Dolfi Stoki Canvas Giclee Art Print features Henry Jones, Senior and Junior from the hit movie Indiana Jones and the Last Crusade. A limited edition of only 95 hand-numbered pieces - each features the artist's authorized signature - the huge unframed Indiana Jones Crusade by Dolfi Stoki Canvas Giclee Art Print measures 30-inches wide x 20-inches tall and comes with a certificate of authenticity.